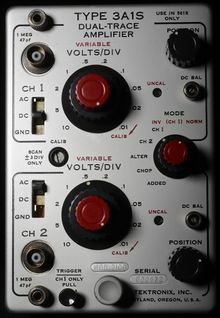 The Tektronix 3A1S is a vertical plug-in for the 561S. The input signal passes through a compensated attenuator switch and then into a 7586 cathode-follower biased with 2 mA plate current. The gain stages use a mix of transistors and output stage driving the deflection plates is a transistor/pentode cascode circuit with T-coil loading. The 3A1S is built in traditional ceramic-strip construction. This page was last edited on 19 April 2016, at 17:43.